I couldn’t do it. I could not go any longer without creating something. I was standing in my pantry earlier, when I noticed a chocolate bar shoved in a crack between some veggie chips and some wheat gluten. Then I realized I had a few more half eaten candy bars shoved other places like some sort of Keebler Elf chocolate hoarder. So, I found the peanut butter and got to work. This is what I came up with.. The beautiful thing about this recipe is 1) it’s creamy and 2) you can just make as much as you have. 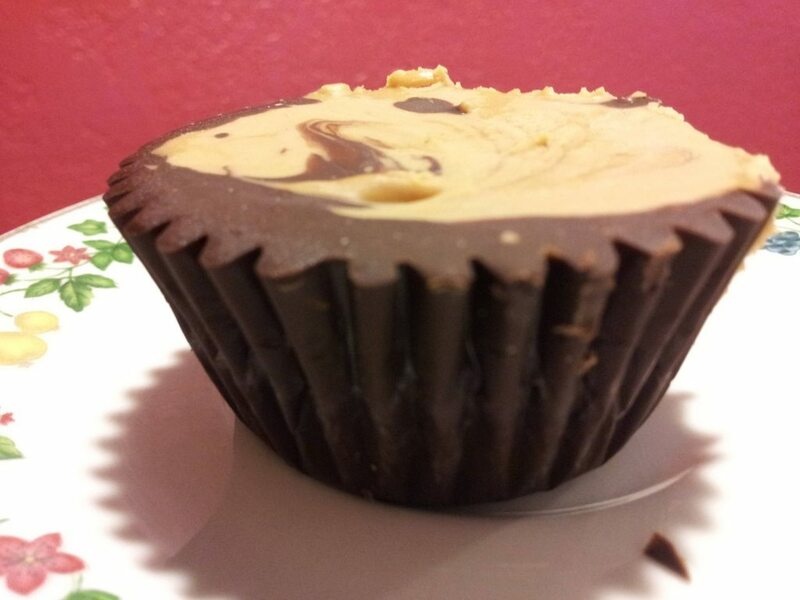 I ended up making 5 big cups, I had about 2.5 chocolate bars when I added it all up, and about 3/4 cup peanut butter. I got anxious and poured the peanut butter into the chocolate when it was still hot, (usually I would do this when the chocolate had sat in the freezer for a few to harden up) and it produced a cute swirl. You could add nuts or toffee or whatever you want, as I always say, be creative, after all it is your food. Melt your chocolate, and add the shortening (if using). Mix well. This will make your chocolate more moist and creamier once it hardens. Mix peanut butter and sugar together, and melt until smooth. You can add more or less sugar, depending on how sweet you want it, and depending on how much chocolate you have. Make sure you don’t have 2 cups of peanut butter and 1/2 cup chocolate. You want it to be slightly more chocolate, and slightly less peanut butter. Pour chocolate into cupcake tins (foil ones) or a small baking dish. You can let the chocolate set in the freezer first, or to make a swirl you can pour the peanut butter in while the chocolate is hot. Place in the freezer until hardened, let thaw for around 10 minutes before serving. Once set, place in the refrigerator. Enjoy this simple treat ! This entry was posted in Recipes and tagged chocolate, confectioners sugar, peanut butter, peanut butter cup, shortening.